• Internal power supply WITH external PSU link option! A balanced XLR connector accepts balanced or unbalanced mic signals. A balanced 1/4" jack accepts balanced or unbalanced line level sources, such as keyboards. Phantom power is individually switchable on every channel, with front panel LED indication of status. Phase reverse is individually switchable on every channel. Precision, low noise mic preamps deliver continuously variable gain between 5dB and 60dB. A Peak LED indicates internal signal levels in excess of +18dBu. A steep 18dB per Octave High Pass Filter is included straight after the preamp to reduce low frequency rumble on stage and clean up vocal performances. A pre-fade, pre-EQ (but post-HPF) insert point is provided for patching in Limiters, Graphic Equalisers or other signal processors. It may also be used for recording. A direct output is also available on every mono channel with individual pre/post fader switching situated on the rear panel. This allows the direct outputs to be equally useful for effects send applications or multitrack tape feeds. GB4 and GB8 incorporate the GB30 4-band equaliser section - based on that used in the high-end MH Series. Both the HF and LF shelving sections have steeper slopes than usual which substantially reduces mid frequency harshness in the HF band and muddiness in the LF. This increase in “cleanliness” of response is further enhanced by an element of undershoot and overshoot in the boost/cut response. 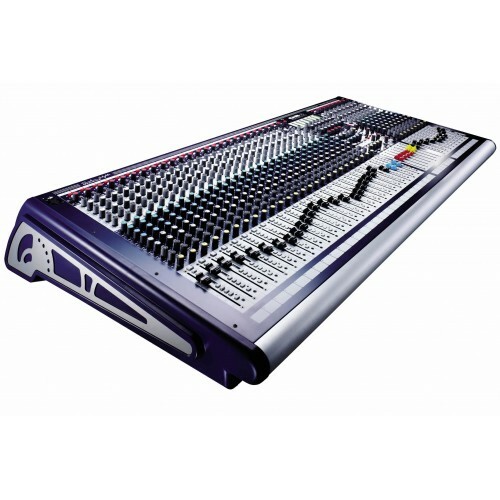 It has two swept mid frequencies carefully selected for optimum control during live performances. All bands provide 15dB of cut or boost. The Low frequency equaliser response shelves at 80Hz. The swept Lo Mid control operates between 80Hz and 1.9kHz. The swept Hi Mid control operates at frequencies between 550Hz and 13kHz. The fixed High frequency equaliser response shelves at 13kHz. The EQ section can be bypassed using the EQ switch, allowing comparison of treated and untreated sounds without having to reset controls. The GB4 has 8 flexible Auxiliary sends which allow the choice of either monitor or effects orientated mixes. Auxes 1-4 are pre-fader and, in normal operation, are routed to the rotary Aux masters 1-4. In SWAP mode, they are routed to Group faders 1-4 and Group meters 1-4, ideal for monitor mixing applications. Auxes 5 to 8 are pre/post switchable - globally assigned selectable per Aux bus from the Master Section. The GB8’s 8 Auxiliary sends (Fig. 1) are globally selectable per Aux bus between pre/post fade. The Auxes are routed to rotary Aux masters, which all feature SWAP mode. Turning the pan control full left or right enables odd or even groups or the left or right Mix bus to be accessed individually. Each channel can be soloed pre-fader, post-EQ to check levels. PFL status is indicated via a front panel LED. Professional grade, 100mm faders provide accurate, consistent control of audio levels and have superb cut-off performance. A 4-segment LED display on each fader strip provides an instant reference for the signal level on that channel.